From the New York Times-bestselling author of The Unlikely Spy, Daniel Silva, comes a taut, lightning-paced thriller rooted assuredly in fact: Switzerland's shameful WWII record of profiteering and collaboration with Nazi Germany. The Unlikely Spy, Daniel Silva's extraordinary debut novel, was applauded by critics as it rocketed onto national bestseller lists. "Briskly suspenseful, tightly constructed...reminiscent of John le Carre's The Spy Who Came in From the Cold," said the New York Times. "Silva has clearly done his homework mixing fact and fiction to delicious effect and building tension - with the breathtaking double and triple turns of plot - like a seasoned pro," praised People. Now, Silva brings his considerable talent to his latest tale of danger and deception, The English Assassin. When art restorer and occasional Israeli agent Gabriel Allon is sent to Zurich, Switzerland, to restore the painting of a reclusive millionaire banker, he arrives to find his would-be employer murdered at the foot of his Raphael. A secret collection of priceless, illicitly gained Impressionist masterpieces is missing. Gabriel's handlers step out of the shadows to admit the truth - the collector had been silenced - and Gabriel is put back in the high-stakes spy game, battling wits with the rogue assassin he helped to train. 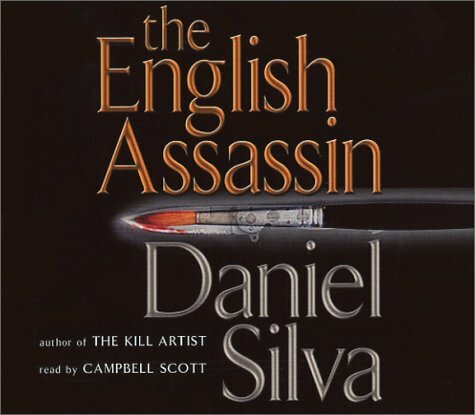 Tense, taut, expertly crafted, and brimming with unexpected reversals, The English Assassin is Daniel Silva at his storytelling best. The English Assassin brings back Gabriel Allon, the appealingly melancholy art restorer with a double life as an Israeli secret agent, first introduced in 2000's The Kill Artist. Gabriel is sent to Zurich under a pseudonym to restore a Raphael belonging to a prominent Swiss banker and art collector, Augustus Rolfe, but upon arriving he finds Rolfe lying in a pool of blood. When Gabriel tries to leave Zurich, the Swiss police capture him immediately--and moreover, they know his real identity. He's released through some diplomatic string-pulling, but he soon discovers that Rolfe had requested a meeting with Israeli intelligence, for reasons unknown, just before his death. Rolfe's daughter, Anna, is a world-class violinist attempting to rebuild her career after an accident that nearly destroyed one of her hands. But her physical scars are nothing compared to those on her psyche, left by her mother's suicide when Anna was a teenager. Temperamental and mistrustful, she nevertheless believes Gabriel's story, and reveals that Rolfe owned a secret collection of priceless French Impressionist paintings, apparently stolen by his murderers. Spy turned art restorer Gabriel Allon finds himself accused of murder in this New York Times bestseller from Daniel Silva. An Israeli spy by trade and art restorer by preference, Gabriel Allon arrives in Zurich to restore the work of an Old Master for a millionaire banker—and finds himself standing in blood and framed for the man’s murder. While trying to clear his name, Allon is swept into a spiraling chain of events involving Nazi art theft, a decades-old suicide, and a dark and bloody trail of killings—some of them his own. The spy world Allon thought he had left behind has come back to haunt him. And he will have to fight for his life—against an assassin he himself helped train.